An exquisite work of silversmith art. 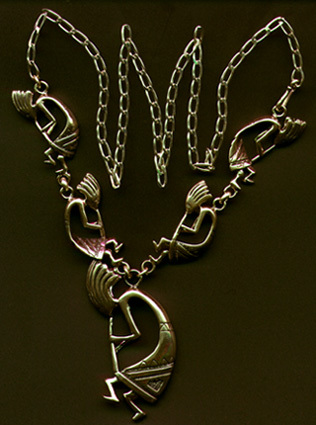 This Sterling Silver Kokopelli Necklace Handcrafted by The Navajo has the approximate dimensions of 13 inches long by 2 3/4 inches by the Kokopelli pendant piece. If you have questions or would prefer to order over the phone Call Toll Free (800)472-6341, (805)445-9400, fax us at (805)493-5937 or Click Here To Email Us. We ship all over the world. Guaranteed Satisfaction. For More quality products click on the following links. Index of Items | Forged / Rod Iron Beds| Wall and Table Art Pieces| Forge Iron Home or Office Accents| Back to More Kitchen Accents | Furniture Styles| J.C. Schahrer Western furniture | Accessories| The Cowboy Collection, Leather Living Room Furniture| Dressers| Fine Furniture Hardware| Rod Iron Fire Place Tools and Accessories | Night Stands| Gifts For All Occasions| Bath-room Accents| General Lighting, Chandeliers, Fixtures and Lamps| Southwestern Rugs| Bee's Wax by Briwax.| Forged Iron Tables, Chairs and Barstools| Rod Iron Furniture | Forge Iron Clocks| Art Pieces | Forged Iron Landscaping Accents and Accessories | Rustic Furniture Hardware | Forged Iron Library Accents and Accessories.